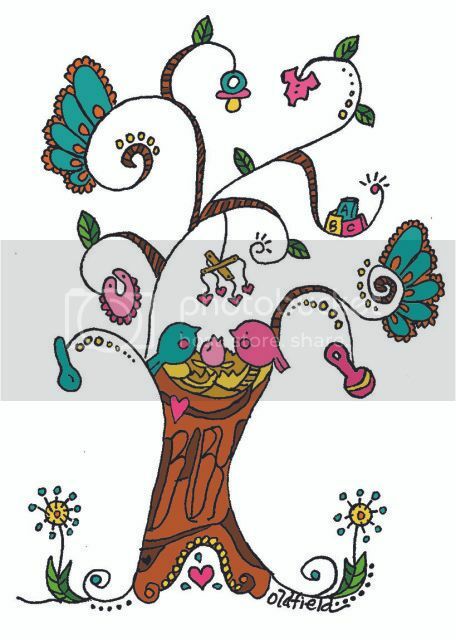 This is a little illustration I did for a wonderful friend of mine that is having her first child-a girl! I did it for a baby shower invitation and it's pretty darn cute. Colors are a bit off as it was a CMYK doc for printing and being my somewhat impatient self I didn't want to adjust for RGB. Anyway, the only color that is really off is the blue. It's really more of a beautiful deeper blue turquoise, not that green. I hope she likes it as the invites are off to print. She is a very special friend and it was kinda hard to do this for her because she is so cool, very hip, great sense of style...I wanted to get it just right! We've had a wonderful day here. Little guy and I picked up older child from school and we all went downtown. First we went to the library. We checked out more books than we could carry! Then we stopped by the Oklahoma City Museum of Art. Boys can't get enough of the Chihuly. I actually checked out this book from the library. Not just for me, but the boys too! 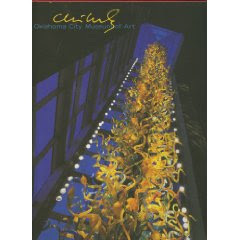 Chihuly: Oklahoma City Museum of Art. While we were there we got our membership-you should too! Did I mention my other excitement? Being a committee member again for the outstanding fundraising event for OVAC, 12x12 Art Show and Sale. It's always a great event and this year will be no less! Speaking of OVAC, I am getting 3 pieces together to enter this show, 24 Works on Paper. Since I am a member I can enter 3 pieces without an entry fee! You know those entry fees can usually be expensive. Even though only 24 works being accepted is a bit of a long shot, I feel like how can I not? Nothing to lose. Looks cool-and it's an IAO collaboration. 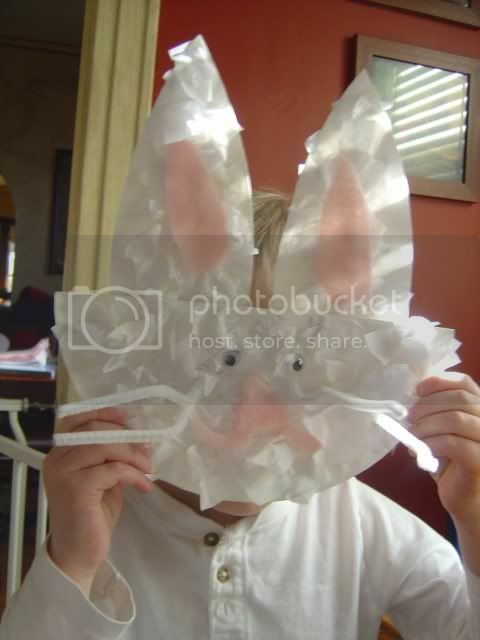 Today I made this fun Bunny face with my 5 year old while little brother slept. We started off with 2 plain cheap white paper plates. We folded both in half. One plate we cut into 2 ears and the other we used for the face. We smeared all the pieces with glue stick and crumpled up small pieces of tissue paper and stuck it down. Then we used pink felt on the ears and face, added google eyes and pipe cleaners for whiskers. I suppose you could cut out eye holes and it could be a fun mask....hmmmm. Might do that next time. 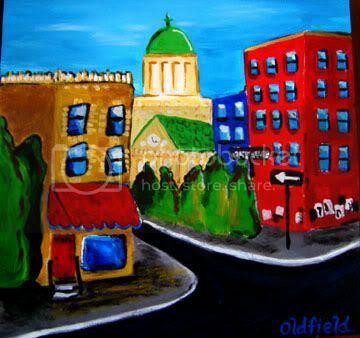 My painting based on a trip to NYC titled, "One Way" is complete! 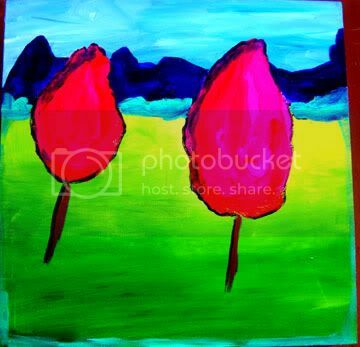 This vibrant work, untitled is based on a hike at Cataract Lake in Colorado. This is a Work in Progress...also still working on the Rock Mary painting I posted earlier. Will post more soon! I'm about to get my boys from school and the silence will be over! I'm working on finishing up my class ideas for the fall semester at the Museum and class descriptions for ArtzPlace Oklahoma, a wonderful facility I will start teaching at this summer. Thanks for stopping by. Have a creative day!